Cheh! Apa punya title daa...Couldn't think of anything better actually...heheh! Anyway, I was trying to gauge audience's preference with regards to Hari Raya and Deepavali commercials. Not that I managed to watch a lot of TV these past few days (weeks, in fact) but I SOO like the You-Can-Make-A-Difference one, where the brother wears a helmet, turned around to put another helmet on his sister's head and said something like "Pakai ni. Pegang Abang kuat-kuat. Nanti jatuh!" while another friend pulled the upih pinang they were sitting on...hehe...So comel!! And then suddenly, "Berhenti! Merah!" when a makcik wearing a red baju kurung passed by in front of them. "Kalau pakai baju hijau macam mana?" asked the Makcik. Jovially they chorused "Jalanlah Mak Long!!" They sounded so natural and I soooo like the commercial. There are other editions by the same organization, and they are all so delighting. The Petronas one, although should be very intriguing, I find it OK saja. Maybe because I've read an email with the exact storyline. So takde trigger any warm/sad feelings lah. THE UMW-TOYOTA ONE!! Tak best langsung and mengarut to the max. Jingle pun tak best.. Tak hape-hape!! So, my personal congratulations to the team behind You-Can-Make-A-Difference commercial and BOO to the team behind UMW Toyota one... Better be more creative next time ok? Selamat Hari Raya and Maaf Zahir Batin!! Actually I takde la rasa excited lebih-lebih this Raya... Entah kenapa, rasa macam Ramadhan went by so fast, and I actually didn't feel like celebrating Raya this year. Rasa macam biasa-biasa je...Raya just marked the end of Ramadhan je.. Dunno why lah?! Anyway, went back to Jasin on the EARLY morning of Raya and reached there at about 3am. All Hubby's other siblings celebrated Raya with their In-Laws this year, so only 3 ketul of us yang ada kat rumah Jasin. Went for rounds of visit to relatives' houses with Mak and Ayah tagging along. Baby Daniel had a blast, anyway. Mana-mana pergi pun, ada je yang sanggup nak tolong jagakan....Especially the kids, they just adored him! Dia pulak pandai main psychology- grinned very sweetly everytime they agah him, angguk-angguk and geleng-geleng kepala ala hip hop dancing (especially when there were music or people singing) etc. 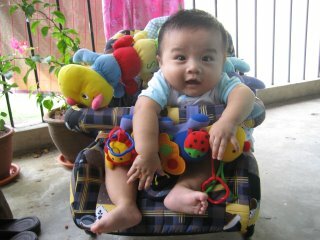 Semua orang geram tengok pipi dia, resulting in his cheeks being red asyik kena cubit and gomol..hehe...Cian baby Mummy.. Went back to Abah's kampung in JayBee on 2nd Raya...Dapat lah jumpa most relatives yang dah lama sangat tak jumpa. Then on the 3rd day of Raya, we went back to Nenek's (Abah's mak) kampung in Pontian. Round ke rumah Atuk2 sedara yang lama tak jumpa. Went back to Jasin that night itself. My name is Kia Picanto. I have been under the care and and also a driving pleasure of a gorgeous Mummy (hehe) since the past 8 months or so. This is my photo..
One fine Saturday afternoon, a small clan consisted of Ayah Lan, Mummy Dura and Baby Daniel wanted to go back to Ayah Lan's hometown in Jasin for a weekend gateaway (chewwah!) After loading everything inside the Samba Green Picca, they wanted to start the journey. To everyone's dismay, the cute Picca refused to budge from the parking space. Aiseh!! What's wrong? After a few tries, it was confirmed that the Picca was 'sick'. The journey was continued using the 'Hero' instead. Picca had to be towed to the Authorized Service Centre (ASC) first thing on Monday morning. An 'operation' ensued, and after the engine was taken out, the ASC found out that the culprit was the gearbox. Turned out that there were 2 cracks on the flat plate of one of the torque converter, causing the auto transmission oil inside the gearbox to be nearly emptied. Since the ASC claimed that it was the first case of such problem they had ever encountered, they were questioned by the HQ SC on the possible cause of the problem. It could be the misalignment of the converter, causing the intense pressure inside and with due time, caused the cracks. Or it was due to parts failure that was overlooked by their QC department. No oil leak were found outside of the engine, thus it was impossible to detect the leakage of the AT oil until it was almost empty. It was fortunate however, that the gearbox chose to malfunction before the oil went completely empty, else it might case the gearbox to be burnt beyond repair! No sparepart was available at that time, so the Picca had to be grounded inside the workshop until the part arrived. A fortnight passed by, with no news of when the Picca would be well again. 1) The car was relatively new, how could it have a severe problem like that? Is it due to very low quality parts being used? Or was it due to problems overlooked during assembly? 2) Why did the parts take so long to reach Malaysia? Why must they consolidate all parts shipment when there were cases like this that needed immediate parts replacement? 3) Mummy was told that she needed to pay for the consumables (in this case the AT oil) because it was stipulated in the warranty booklet for the car. The AT oil for Picca (and also Sorento), indeed are special AT oil and cost a bomb! Picca needed about 5.2 litres of AT oil if the gearbox is completely empty and a litre of the oil costed RM45. Meaning Mummy had to pay for 6 bottles of the AT oil for RM270. Why should she pay for it when it was caused by the parts failure? Does that mean if the problem arises again later, Mummy had to pay another RM270 for the oil when the real culprit is the part failure? 4) Who was going to be charged for Mummy's depression caused by the problems (as listed above) and also the RM spent? Could Mummy claim them back from the HQ SC? After all, they caused Mummy those problems!! Mummy had a verbal confirmation from the ASC that it was not her fault that she did not realize that the problem was forthcoming. After all, the cracks were inside the torque converter, which is inside (or was is attached) to the gearbox, which was located WAY below the whole engine. Even the ASC needed to take out the whole engine before they were able to take out the gearbox and the torque converter. And how was Mummy supposed to do that? If it was because of negligence, no traces of oil were leaking from the gearbox- it was all inside! Wow!! It has been quite a long time since I last wrote... Had been terribly busy with work... Ingat bulan puasa semua kena slow down ke? Turned up the other way round pulak...Work and life had been hectic...Sampai tak terasa pun dah nak raya...Betul!!! My baby is not feeling well today...well, actually since semalam... Brought him to a clinic last night sebab dia asyik batuk-batuk and merengek dari pagi semalam. Badan tak panas, tapi kaki quite warm. Turned out the Doc said, he got a very high fever! Kena masuk ubat kat that tiny hole underneath, in order to quickly bring the temperature down...Poor baby! He cried a bit during the procedure, but after that ok dah. Pelik jugak sebab the whole body memang tak warm langsung! Only his feet were quite warm, thus I overlooked the possibility that he was having fever. He was still having it this morning, and I had asked his babysitter to follow the medicine schedule. Called the babysitter just now and she said Daniel's feet are no longer warm, and she had given him the morning dose. I feel so guilty for having to leave him behind and went to the office this morning, but today is the last day working for me before my Raya holidays and I still have some things to settle. Normally, if he is not feeling well, I would take leave to take care of him (tu pasal la annual leave and MCs had been used till the max! hehe) Kesiannya baby Mummy!! Get well soon my love! Kita nak raya dah ni!! Ada banyak cerita yang happened during my absence from the blogging world ni... Semuanya drafted dalam kepala je...Bila nak tulis, lupa la pulak! Aiseh!! Will continue later, sebab now need to go out and buy a better thermometer... The one that I am currently having is not so accurate lah...Dah la kena letak kat bawah armpit, and being a very lasak boy, Daniel couldn't sit still throughout the process of taking his body temperature. Jadi, reading tak accurate. 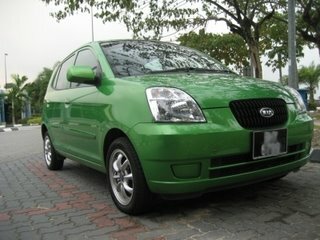 Am thinking of buying yang IR tu...Simple and fast. Tengok lah kang apa yang I dapat... See ya!! Scene: It was very hazy and humid. There was a small booth setup on the walkway of the shoplot. It was Celcom's agent trying to promote their stuffs. Moi: (Smiled sweetly) No thanks! Agent 2: (While holding a mobile phone to his ears, apparently waiting for the other party to pick up his call, said rather LOUDLY too the Indian customer)INI AHH!! MELAYU AHH!! INI BULAN PUASA SEMUA MELAYU!! MELAYU!! LU ADA FAHAM KAH? MELAYU!! SEMUA MATI!!! Some of us are just SOOOO insensitive towards other's feelings... Kalau nak kutuk pun, cover line la sikit...Chis!! We went back to Hubby's hometown last Saturday afternoon. My cute car buat hal, so we ended up balik kampung using Hubby's Hero (aka Wira)...keke...Jammed jugak kat Seremban up to Senawang, and we arrived a tad after everybody had finished berbuka. Baby Daniel, as usual, excited with all the commotion of people around him. Dengan Aunties and Uncles, Atuk, Nenek yang geram tengok dia and all his cousins yang riuh rendah. He refused people carrying him, though. Menangis macam kena cubit. Mummy jugak yang kena dukung....hehe...In the end, decided to put him on the toto blanket, and he happily golek-golek around and gelak-gelak with people around him. But, see no touch, ok? Touch me and my crying button would be switched on, mind you? When everybody was busy chatting with each other, dia pun nak join jugak. Kelakar tengok dia menyampuk his Pak Long and Pak Lang bercakap, sampai diorang pun tak jadi nak sambung cakap and we all terus gelak. And he refused to sleep! Sampai Mummy keluarkan white flag- I couldn't tahan already. So, Ayah had to take over lah. Ayah said he finally dozed of at about 1.30pm. Orang lain semua dah tidur pun, termasuklah all the other little angels. We buka puasa at Abang E's house. Kak Ina and family pun datang, maka riuh rendah lah rumah tu dengan kanak-kanak riang sekalian. Daniel pun apa lagi? Kononnya nak join in the fun lah. Gelak bukan main kuat lagi tengok his cousins playing around him. His eyes were getting red from his sleepiness, but still he refused to sleep. Until about 9.30pm, he couldn't take it already, and began his tantrums. 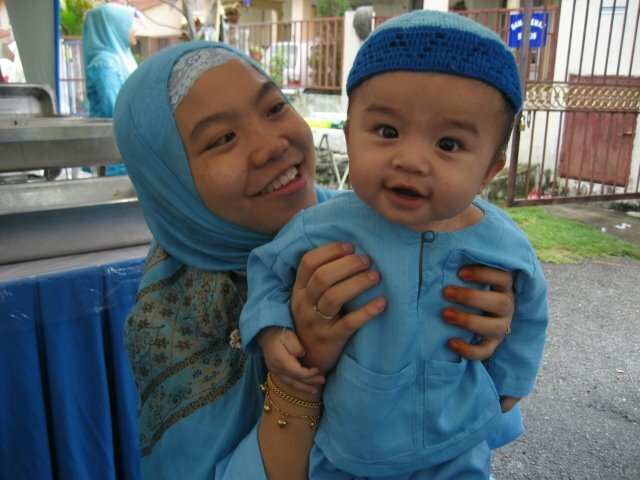 Again, Mummy sudah sakit belakang from holding his 8.6kg weight most of the time, so Mummy gave up again. Ayah then tried to get him asleep upstairs with the aircond on. Ada pulak yang tengah tengok Ice Age 2 kat atas. Macam mana nak tidur? When Daniel started screaming already, we quickly took leave. Couldn't tahan dah. Masuk je kereta, with a few pat on his hand, terus hanyut. Dah ngantuk sangat sampai tak sedar apa-apa dah. He woke up for a few minutes to play with his Atuk, Nenek and Pokcu when we reached home, then continued sleeping sampai pagi. Happy 7th Months Darling Daniel!!! Mummy doakan awak jadi anak yang soleh, sihat dan dalam rahmat Allah selalu....I love you so much, you know that, right?